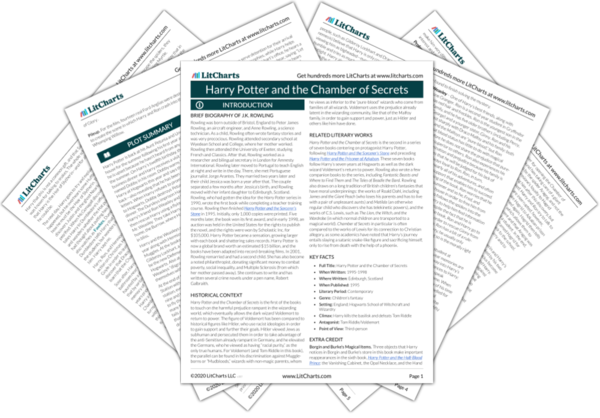 Instant downloads of all 945 LitChart PDFs (including Harry Potter and the Chamber of Secrets). 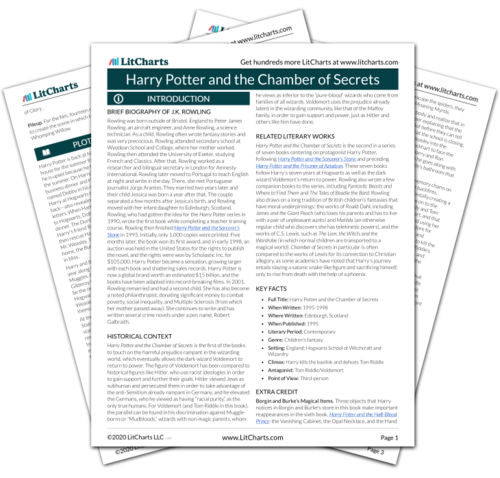 Welcome to the LitCharts study guide on J.K. Rowling's Harry Potter and the Chamber of Secrets. Created by the original team behind SparkNotes, LitCharts are the world's best literature guides. A concise biography of J.K. Rowling plus historical and literary context for Harry Potter and the Chamber of Secrets. A quick-reference summary: Harry Potter and the Chamber of Secrets on a single page. In-depth summary and analysis of every chapter of Harry Potter and the Chamber of Secrets. Visual theme-tracking, too. Explanations, analysis, and visualizations of Harry Potter and the Chamber of Secrets's themes. Harry Potter and the Chamber of Secrets's important quotes, sortable by theme, character, or chapter. Description, analysis, and timelines for Harry Potter and the Chamber of Secrets's characters. Explanations of Harry Potter and the Chamber of Secrets's symbols, and tracking of where they appear. An interactive data visualization of Harry Potter and the Chamber of Secrets's plot and themes. Rowling was born outside of Bristol, England to Peter James Rowling, an aircraft engineer, and Anne Rowling, a science technician. As a child, Rowling often wrote fantasy stories and was very precocious. Rowling attended secondary school at Wyedean School and College, where her mother worked. Rowling then attended the University of Exeter, studying French and Classics. After that, Rowling worked as a researcher and bilingual secretary in London for Amnesty International. Rowling later moved to Portugal to teach English at night and write in the day. There, she met Portuguese journalist Jorge Arantes. They married two years later and their child Jessica was born a year after that. The couple separated a few months after Jessica’s birth, and Rowling moved with her infant daughter to Edinburgh, Scotland. Rowling, who had gotten the idea for the Harry Potter series in 1990, wrote the first book while completing a teacher training course. Rowling then finished Harry Potter and the Sorcerer’s Stone in 1995. Initially, only 1,000 copies were printed. Five months later, the book won its first award, and in early 1998, an auction was held in the United States for the rights to publish the novel, and the rights were won by Scholastic Inc. for $105,000. Harry Potter became a sensation, growing larger with each book and shattering sales records. Harry Potter is now a global brand worth an estimated $15 billion, and the books have been adapted into record-breaking films. In 2001, Rowling remarried and had a second child. She has also become a noted philanthropist, donating significant money to combat poverty, social inequality, and Multiple Sclerosis (from which her mother passed away). She continues to write and has written several crime novels under a pen name, Robert Galbraith. 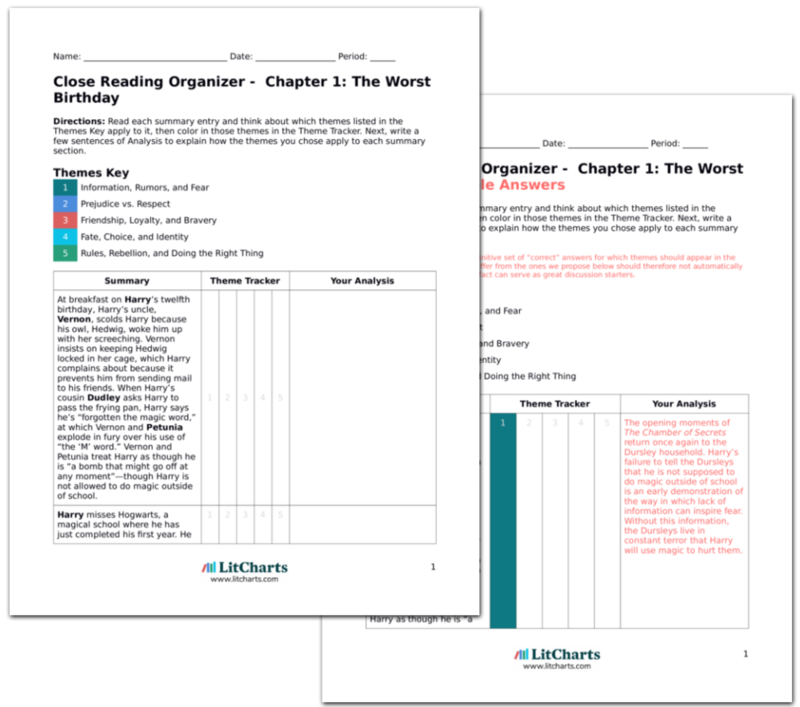 Get the entire Harry Potter and the Chamber of Secrets LitChart as a printable PDF. Harry Potter and the Chamber of Secrets is the first of the books to touch on the harmful prejudice rampant in the wizarding world, which eventually allows the dark wizard Voldemort to return to power. The figure of Voldemort has been compared to historical figures like Hitler, who use racist ideologies in order to gain support and further their goals. Hitler viewed Jews as subhuman and persecuted them in order to take advantage of the anti-Semitism already rampant in Germany, and he elevated the Germans, who he viewed as having “racial purity,” as the only true humans. For Voldemort (and Tom Riddle in this book), the parallel can be found in his discrimination against Muggle-borns or “Mudbloods,” wizards with non-magic parents, whom he views as inferior to the “pure-blood” wizards who come from families of all wizards. Voldemort uses the prejudice already latent in the wizarding community, like that of the Malfoy family, in order to gain support and power, just as Hitler and others like him have done. Harry Potter and the Chamber of Secrets is the second in a series of seven books centering on protagonist Harry Potter, following Harry Potter and the Sorcerer’s Stone and preceding Harry Potter and the Prisoner of Azkaban. These seven books follow Harry’s seven years at Hogwarts as well as the dark wizard Voldemort’s return to power. Rowling also wrote a few companion books to the series, including Fantastic Beasts and Where to Find Them and The Tales of Beadle the Bard. Rowling also draws on a long tradition of British children’s fantasies that have moral underpinnings: the works of Roald Dahl, including James and the Giant Peach (who loses his parents and has to live with a pair of unpleasant aunts) and Matilda (an otherwise regular child who discovers she has telekinetic powers), and the works of C.S. Lewis, such as The Lion, the Witch, and the Wardrobe (in which normal children are transported to a magical world). Chamber of Secrets in particular is often compared to the works of Lewis for its connection to Christian allegory, as some academics have noted that Harry’s journey entails slaying a satanic snake-like figure and sacrificing himself, only to rise from death with the help of a phoenix. Borgin and Burke’s Magical Items. Three objects that Harry notices in Borgin and Burke’s store in this book make important reappearances in the sixth book, Harry Potter and the Half-Blood Prince: the Vanishing Cabinet, the Opal Necklace, and the Hand of Glory . Pileup. For the film, fourteen real Ford Anglias were destroyed to create the scene in which Harry and Ron crash into the Whomping Willow. Emanuel, Lizzy. "Harry Potter and the Chamber of Secrets." LitCharts. LitCharts LLC, 1 Apr 2019. Web. 23 Apr 2019. Emanuel, Lizzy. "Harry Potter and the Chamber of Secrets." LitCharts LLC, April 1, 2019. Retrieved April 23, 2019. https://www.litcharts.com/lit/harry-potter-and-the-chamber-of-secrets.